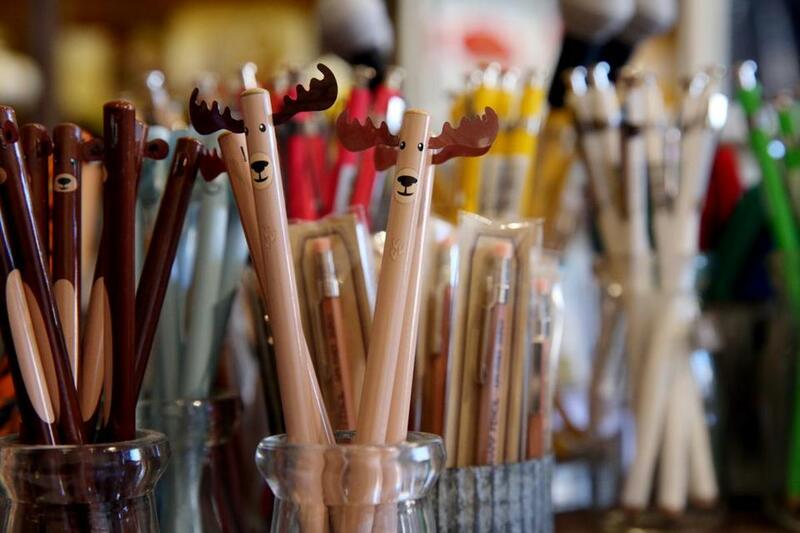 There’s a pencil for every writer at the The Paper Mouse in West Newton. That’s what I’m thinking as I stand on the sidewalk peering through the storefront of The Paper Mouse in West Newton Square. A glance through the front window takes in the entire shop, 500 square feet divided by antique French doors. The walls are lined with hand-built shelves and tables. Potted plants dot a landscape of illustrated cards and stationery, hand-picked pens and pencils, sushi-shaped erasers, and lefty pencil sharpeners. And in the back, on beams above the checkout, an installation of tiny lights twinkles like stars. “We wanted it to be cozy, inviting, a little private gallery, something new and different tucked away,” said Loren Sklar, 54, one of the owners. 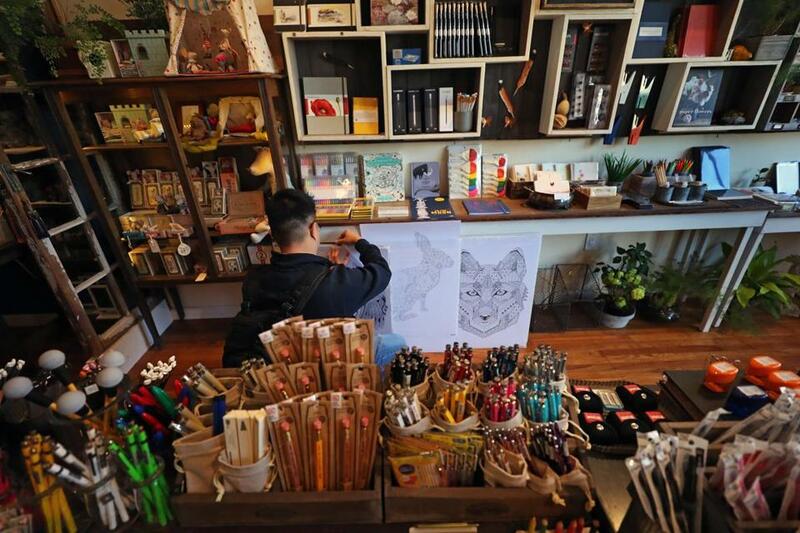 The shop is a purveyor of fine stationery, writing implements, paperclips, pads, notebooks, toys and candy, and a line of Felix Doolittle cards and other illustrated paper products made in small batches in a studio several streets away. But in a world of e-cards, chock-full retail shelves, and mass-produced everything, The Paper Mouse is an outlier. “When you come to the shop, we want you to have an experience,” said Felix Fu, 57, Sklar’s husband and the artist who also founded Felix Doolittle. 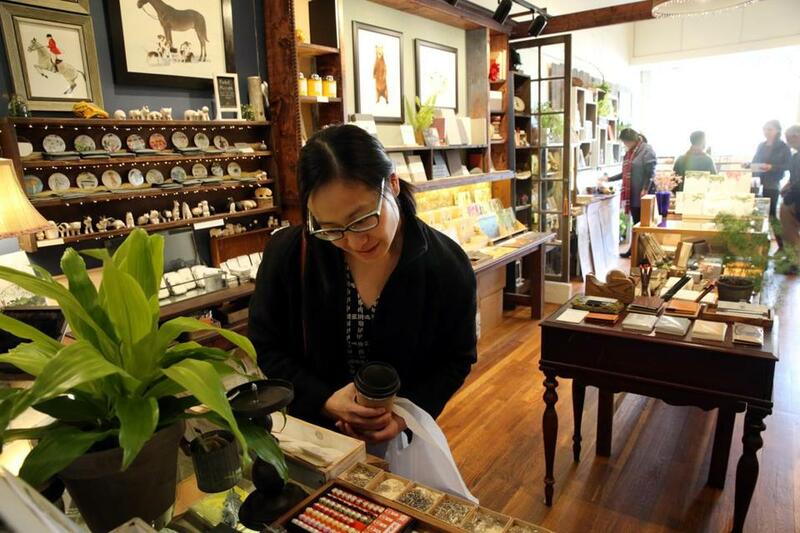 Christine Hsieh shops at The Paper Mouse in West Newton. The store, which opened two years ago, is a labor of love among four friends. 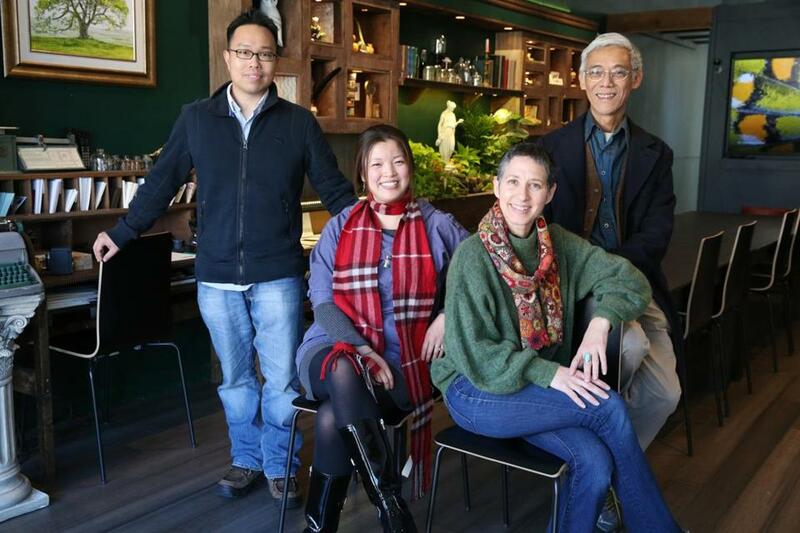 “A business by bond and belief,” said partner Victor Lee, 40, a third-generation Newton resident who attended local schools. Lee remembers how in early childhood he imagined following in the footsteps of his grandfather, who ran a laundry in the village of Nonantum, and his father, who operated the Golden Star restaurant in Newtonville. After working in high tech for 20 years, Lee wanted to reexplore that dream. He shared his thoughts with his wife, Jenny Zhang, 33, and their friends, Sklar and Fu, during conversations that lasted late into the night. Fu had gone through his own career change about 14 years ago, when he left his job as a restaurant consultant. While mulling over his future in his wife’s studio, he decorated the outgoing mail with calligraphy and drawings. Before long, they were creating Felix Doolittle stationery, which became a 2009 Oprah Pick. At first the two couples contemplated opening a cafe. They decided instead to open a stationery and gift shop, but had to find a name. From left to right, Victor Lee and his wife Jenny Zhang, with Loren Sklar and her husband, Felix Fu. Sifting through their respective Chinese zodiac signs, they quickly eliminated pig, snake, and tiger, deferring to Zhang’s birth in the Year of the Mouse. And on November 19, 2015, The Paper Mouse fit into its tiny space on Washington Street as easily as a real mouse slips through a crack. “This is the best shop in the universe” children who wander in on their own, or accompanied by a parent, tell Zhang. The Paper Mouse is down to earth and affordable. One paper clip bunny will set you back 30 cents. Pencils and erasers can be purchased for under $2. Fountain pens are pricier, but not ridiculously so, selling for between $25 and $250. 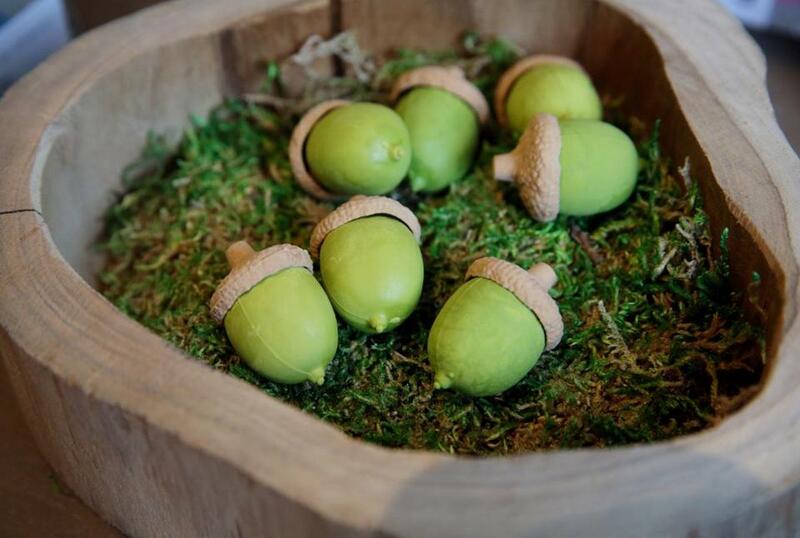 Acorn erasers are displayed at The Paper Mouse. Two doors away is the shop’s new Atelier, a workshop, classroom, and event space fitted into a correspondingly small space where adults and children come to learn penmanship, calligraphy, and drawing. Here, a Victorian fountain gurgles in a garden planted in a sink, and Fu’s fabricated white owl, hanging from the ceiling like a totem, carries a companionable mouse on its back, the creature’s tiny red scarf lifted by an imaginary wind. And on the back wall, a single nod to the outside world: a large electronic screen. Back in the shop, Sklar wraps up a tour at the Pen and Pencil Bar. You can test a pencil that sheds rainbow-colored peels when rotated inside a sharpener. You can try the colored pens, arranged like lipsticks. And you can even take a quick lesson in calligraphy, learning how to alternately press and lighten your grasp on the pen as you glide it across a piece of paper as smooth as ice. All that’s required is attention and openness. The Paper Mouse is located at 1274 Washington Street, West Newton. Holiday hours are Monday through Friday, 11 a.m. to 7 p.m.; Saturday, 10 a.m. to 8 p.m.; Sunday 11 a.m. to 4 p.m. 617-928-9898; www.thepapermouse.com. 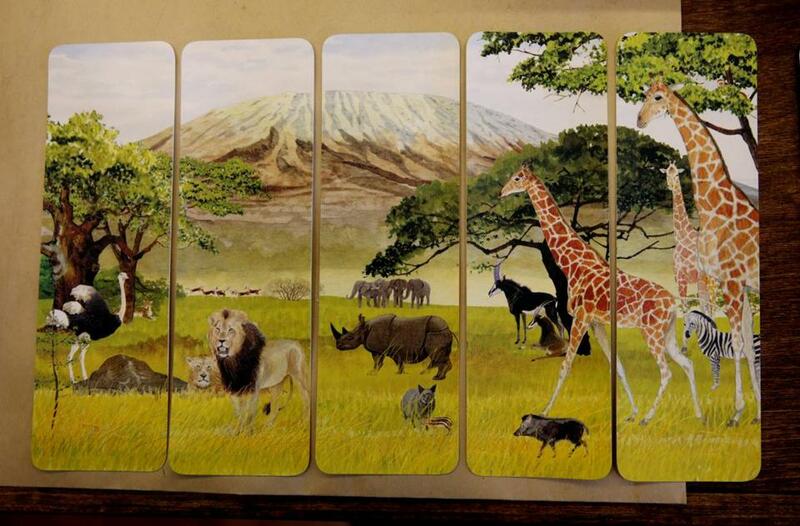 Bookmarks by Felix Fu are displayed at The Paper Mouse. Victor Lee, one of the four co-owners, fixes up a display. 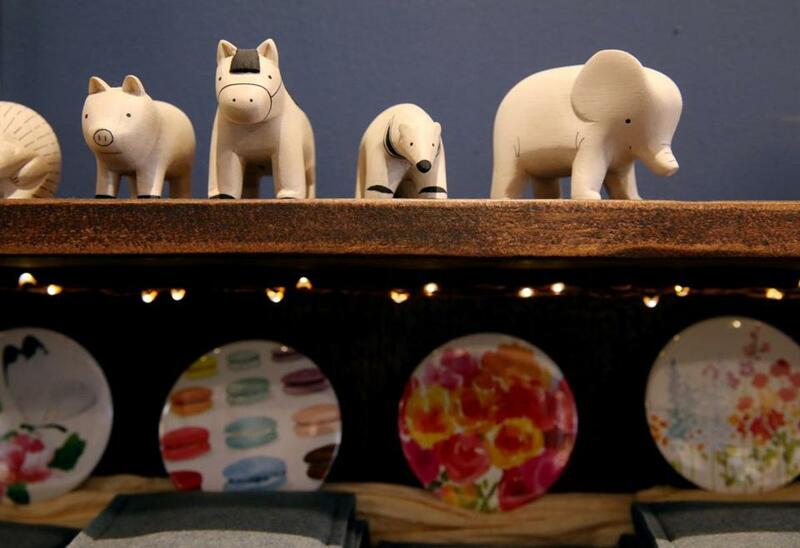 Handcarved animals from Japan are displayed at The Paper Mouse.